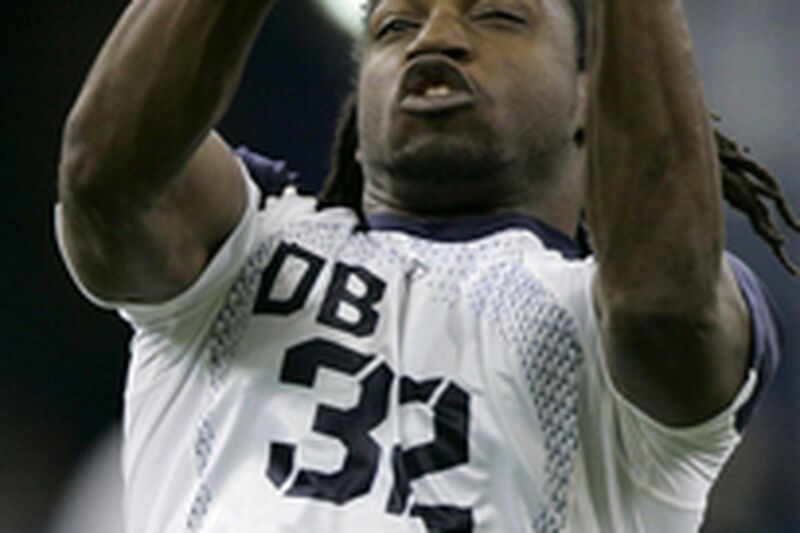 Miami safety Brandon Meriweather rates high in versatility. IN 1996, the Eagles wanted to use one of their two second-round draft choices to trade up, so they could climb higher than 25th in the first round. They had their sights on a big-play linebacker, either Reggie Brown, who ended up going 17th to the Lions, or John Mobley, who was drafted 15th, by the Broncos. When their trade talks came to nothing, the Birds stayed at 25 and selected offensive lineman Jermane Mayberry. They took tight end Jason Dunn with their initial second-round choice, 54th overall, then used the second-rounder they'd thought about trading, No. 61, on a Clemson safety named Brian Dawkins. Brown and Mobley are retired now after neck injuries, Brown after playing just two seasons, Mobley after eight, one of which saw him win All-Pro honors. Mayberry retired this past season after a distinguished career, the first 8 years of it spent in Philadelphia. Dunn, released by the Birds in 1999, has become a steady blocking tight end for Kansas City. And the Eagles are very happy they didn't trade that 61st pick, probably the best second-round selection in franchise history. Following that draft, Kevin Mulligan wrote this for the Daily News: "A couple of years from now - or maybe even this fall - we'll know for sure if they held on too tightly to the extra second-round choice [No. 61] they received for Seth Joyner's 1994 plunge into free agency's deep, rich water. "If safety Brian Dawkins, No. 61, proves to be the second coming of Wes Hopkins, or even Greg Jackson - the Eagles need him to be one of those - then holding on to that extra second-rounder will have been the right call." When the draft convenes again tomorrow, the Eagles are expected to address the issue of finding an eventual successor to Dawkins, perhaps with their first selection, 26th overall. This is said to be a deep draft for safeties, with LSU's LaRon Landry expected to land somewhere in the top 10 overall and a highly touted trio of safeties expected to go fairly quickly thereafter. Much has been written and said about how Florida's Reggie Nelson stacks up against Miami's Brandon Meriweather and Texas' Michael Griffin, whether this one or that one is more of a first-round or second-round talent. One thing to remember, though. The idea that any of these guys is really going to become another Brian Dawkins is probably ridiculous. There will be a Dawkins successor, likely within a few years - he turns 34 in October - but odds are, it will be on the order of Rick Schu succeeding Mike Schmidt. We are talking here about a six-time Pro Bowler, probably the best safety in the 75-year history of the franchise. Last season, Eagles coach Andy Reid, that effusive, praise-spouting fountain of superlatives, called Dawkins a future Hall of Famer. Dawkins currently is Philadelphia's longest-tenured pro athlete, and he has played in more winning games, regular-season and playoff, than anyone in franchise history. Another thing to remember: Even if one of these guys is another Brian Dawkins, it might not be so easy to differentiate him from the others this weekend. Before Dawkins was taken with the final pick of the second round, the Chiefs also were looking for a second-round safety. They chose 58th, and they astutely nabbed the immortal Reggie Tongue. If Dawkins were in the 2007 draft, he'd probably go a lot higher than 61st. The league's thinking about safeties is changing. Years ago, they were guys who weren't quite fast enough to be corners, or quite big enough to be linebackers. Dawkins, who in his prime could fly across the field in coverage or blow up a quarterback on a blitz, helped change perceptions of what a safety could do. In the Cover 2 schemes so popular now - both Super Bowl teams ran them - corners cover close to the line of scrimmage and safeties cover deep. If Landry is indeed the first defensive back off the board tomorrow, this will be the third time in the 4 years a safety has been taken ahead of the draft's first corner, ESPN.com's Len Pasquarelli noted recently. He contrasted this with the fact that over the past 20 drafts, first-round corners outnumbered safeties more than 2 to 1. Eagles general manager Tom Heckert said it's especially hard to evaluate safeties coming out of college, because they rarely do the things NFL defenses will require them to do. "You have to watch a lot of tape to see them play the ball," he said. "I think Sean Considine is going to be a great player," said Heckert, who added that "I may be completely out of my mind." Considine will never be Dawkins physically, but he has the coverage instincts that have become so critical. "Right now, everybody's going, 'You've got to have a safety who can cover,' and those guys don't exist a whole lot," Heckert said. "To get a guy that's 200 pounds and can cover, that's tough to find. There are a few of those guys this year." Heckert noted that there are some corners in this draft who project as safeties. This doesn't sound like something you'd do with your first-round pick, but it certainly could happen in the second or third round, and remember, the Eagles seem to be open to moving out of the first round if they could, say, draft twice in the second and restore the fourth-round selection they sent to New Orleans for Donté Stallworth. Tanard Jackson, of Syracuse, and Marcus McCauley, of Fresno State, are two college corners who have been mentioned as potential NFL safeties. Among the big three safeties after Landry, Meriweather seems to be the most versatile and experienced, Nelson maybe the guy with the most deep-coverage upside. Griffin might be more of a strong safety than a free safety in the NFL. There has been speculation among Eagles fans that hard-hitting corner Sheldon Brown (just ask Reggie Bush) could switch to safety, but Heckert said the Birds aren't contemplating that. "We like him as a corner," Heckert said. The Eagles also are in the market for a corner, though - Rod Hood left in free agency and Will James is signed just for 1 year - and it wouldn't be a shock to see them go that way in the first round, presumably waiting until later for a safety - Jackson, McCauley, maybe Oregon State's Sabby Piscitelli, Virginia Tech's Aaron Rouse or Utah's Eric Weddle. A first-round corner at No. 26 could be Texas' Aaron Ross or Arkansas' Chris Houston. A second-round corner could be UNLV's Eric Wright. If they get defensive-backfield help in the first round, the Eagles might very well go for a running back in the second or third, Heckert's recent endorsement of Ryan Moats notwithstanding. Moats seems to be talented but has proved to be a poor fit for the Eagles' offense; he might net a second-day draft pick this weekend. The Birds could also be in the market for a linebacker, a defensive end, a tight end and, if the right guy falls to the right spot, a developmental quarterback. Some observers predict a run on corners and safeties late in the first round, maybe starting well before the Eagles pick. If that happens, they might just go in another direction, rather than talk themselves into drafting for need if the guys they've rated for the first round are all gone.